The mechanism of speciation has been studied in certain species very thoroughly. Believe it or not a species flock in this case is a group of closely-related fish species. Special diets for each species demand specific jaw and pharynx shapes. Instead of eating fish, many South American cichlids have specialised in other well-developed predations. They occur in rivers, while most research, especially on African cichlids has been on lake species. Many animals may have speciated in these "flocks" if conditions for adapting to their environment are suitable for their evolution. We would expect a fish's body form in lakes to depend on habitat, with heavy bodies associated with the littoral zones while slender fish are often found in surface habitat (pelagic) zones. Habitats in lake systems of course vary a lot in dissolved oxygen, depth and temperature, while our rivers here must differ a lot! Image above: Ecomorphological and dietary comparison of the Uruguay River Crenicichla species flock. 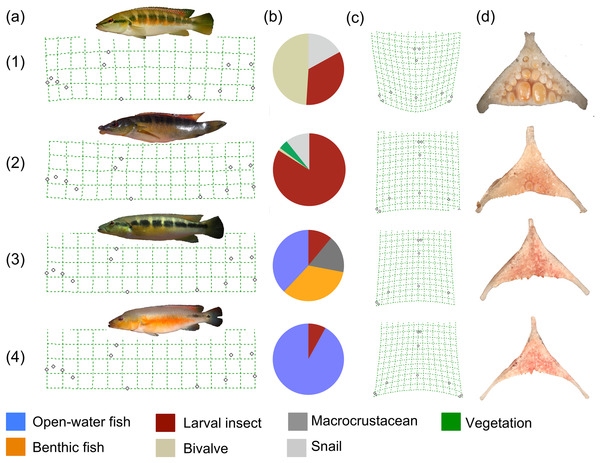 Live representatives of C. minuano (1), CRMN, C. tendybaguassu (2),CRTE, C. missioneira (3), CRMS, and Crenicichla celidochilus (4), CRCE, are associated with their whole body warp transformation grids (a), summaries of their stomach contents (b), lower pharyngeal jaw warp transformation grids (c) and representative lower pharyngeal jaw (d). In order to evaluate the diet, carbon and nitrogen isotopes were analysed to identify prey items exhaustively. Stomach contents were used to check on other aspects of prey, such as proportions of different prey organism. Bottom-living invertebrates proved to be the most popular animals caught by CRTE but CRMS retained thee ancestral piscivorous diet of fellow cichlids and characin fish. The most specialised were CRMN, eating mollusks and CRCE, eating characin fish. With fish-eating the ancestral condition for all, the pike cichlids Crenicichla were obviously deviating from their previous norm in river niches. This "flock" had moved into 4 different "guilds," leaving molluskivory (of both bivalves and snails) as the most specialised new habit. The other main deviation from fish-eating was general or general invertebrate feeding. The jaws and lips evolved for each specific diet. For example CRMN has reduced jaws with massive molar type teeth. You would imagine these gnashers as being perfect for crushing shells. The head shape of these fish has developed rare "isognathous" states for the molluskivorous and other diets. Loss of lips tends to be found in rock grazers that specialise in algae and invertebrates such as mayfly. These unique findings show up a great variety of prey among the species flock. Being primarily carnivorous, these animal are higher up the food chain than most examples of a "flock." Most fish eaters have apparently become fixed in shape and jaw design. This move away from piscivory seems to have made the Crenicichla spp more diverse. Now we can hope to find other animals explaining their evolution to us, using the technology and research methods that reveal this story from the rivers of South America. Edward D. Burress and the 5 other authors published in PLoS ONE. They hail from Appalachian State University, North Carolina, Montevideo University and Museo Nacional de Historia Natural, Montevideo, Uruguay.